Refer to Mill Hill Color Card for colors of beads. Mill Hill, Just Another Button Co. and more. Many kinds of charms. Sterling Silver and more. 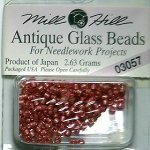 Mill Hill Antique Glass Beads for needlework projects. 2.63 grams per container. 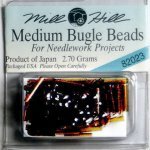 Product of Japan but packaged in U.S.A.
Mill Hill Bugle Beads for Needlework. Small, Medium and Large. 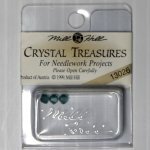 Made in Japan but packaged in U.S.A.
Mill Hill Crystal Treasures for needlework projects. Product of Austria. 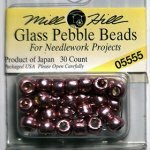 These beads are faceted irredescent colors, sparkly. 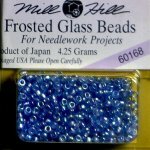 Mill HIll Frosted Glass Beads for needlework projects. 4.25 grams per package. Product of Japan, but packaged in USA. 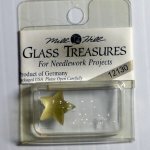 Mill Hill Glass Treasures for needlework projects. 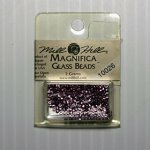 Mill Hill Magnifica Glass Beads. 2 Grams per package. 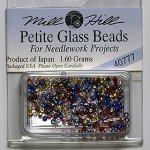 Mill Hll Glass Pebble Beads for needlework projects. 30 count per package. Petite Glass Beads. 1.60 grams per package. Product of Japan, but packaged in USA. 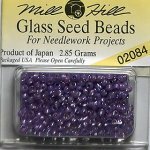 Mill Hill Glass Seed Beads for needlework projects.4 grams per package. Earring Frames for embroidery presented by Elizabeth Anderson Miniature Embroideries.